I did not feel out of place at all. 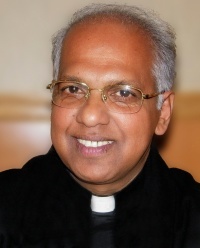 Mine was the lone blonde head in a sea of people of Indian descent who were worshipping at the St. Thomas Syro-Malabar Catholic Church in Northeast Philadelphia last Sunday morning. It seemed like I had been coming here for years. The mass or Qurbana was being celebrated completely in a foreign language. Two priests recited prayers from a front table or altar that was in front of the main altar. The congregation chanted their unintelligible replies. I guessed that one of the priests was Fr. Augustine, the pastor of the parish, because he looked like the picture on the website. He had invited me to teach the 13-17 year old CCD students about St. Therese after the mass. On either side of the main altar were four large pictures of holy people. One picture showed the Blessed Virgin Mary holding the Child Jesus and another one was most likely St. Thomas. Another one of the pictures, I learned later on, was of St. Alphonsa of the Immaculate Conception. 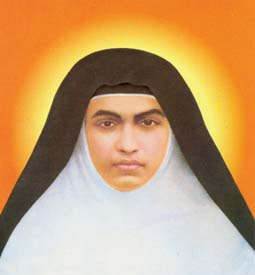 She was a Syro-Malabar Franciscan sister who died in 1946 and was the first person ever of Indian descent to be canonized a saint by the Catholic Church when she was declared a saint by Pope Benedict XVI in 2008. The tabernacle was covered with a blue veil and golden pillars were situated on either side. The music ministry had a section in the right front of the church. Fr. Augustine came over and greeted me very warmly at the conclusion of the first mass. We talked about the details of my presentation and he inquired about my ministry. His kind eyes and mild manner made me feel right at home. He introduced me to the head of the CCD program and to a few other men before excusing himself to prepare for the next mass in ten minutes. All of a sudden a great commotion broke out. Men from every direction converged on the temporary wall behind me and moved it away in pieces to reveal another large area behind me half as big as the church in front of me. It was the overflow seating for the second mass. There was going to be a lot of people! Within five minutes the population of the church tripled. Women in gorgeous saris of every color, babies dressed in white, and gentlemen in their Sunday best entered the sanctuary from every direction. The priests processed in and authentic Indian music sounded from the music section. It sounded like a holy Bollywood production sans dancing! The richness of the liturgy that was sung in both Malayalam and English combined with the beautiful music and the myriad of colors was a feast for the senses. Malayalam is one of 22 languages spoken in India, predominantly in the state of Kerala in the south of India where most of the Syro-Malabar Catholics came from. I was so mesmerized by the proceedings that I didn’t care that I couldn’t follow the mass at all. I just prayed in my heart and soaked it all in. Fr. Augustine concelebrated the mass with a visiting priest who had a very powerful voice. Much of the mass was sung by the priest from the table in front of the main altar. The consecration took place at the main altar with the priests facing away from the congregation. The consecrated hosts were distributed during Holy Communion in a similar fashion to the Latin Rite and unlike in the manner of the Byzantine and Ukrainian Catholic Rites where Holy Communion is given under both species with a type of spoon. Fr. Augustine introduced me by name at the end of the mass and had me stand up to be acknowledged by the congregation. My presentation on St. Therese took place after the mass in a large room adjacent to the CCD classes. Several male students set up the chairs as I arranged my picture of St. Therese and the podium. Soon after the older students filed in and took their seats. One teacher told me that only about 40 students would be attending instead of the usual 100 or so because many of the students were away for the Memorial Day holiday and a youth conference in Maryland. The students were well-behaved and attentive during the presentation as I meandered around the stage teaching them about the “greatest saint of modern times”. Almost all of the students venerated the First Class Relic of St. Therese following the talk. As I was packing up my things to leave, I was invited to attend a small banquet of authentic Indian food. Not one to turn down a meal, I consented and was led to a small room where several women in saris were setting out platters of food. Before I knew what hit me, several of them were filling up plates of food and setting them in front of me. I said that I would wait for the others to eat, but they told me that I should begin. Nobody had to tell me twice! Several of the women asked me questions about myself and taught me about their traditions. I was winding down my two plates of food and my portion of pineapple upside down cake as a sort of business meeting started. I thanked everyone for their gracious hospitality as Fr. Augustine escorted me upstairs to say goodbye. I was very touched by the friendliness and warmth of everyone I met last Sunday at St. Thomas Syro-Malabar Catholic Church. Fr. Augustine invited me to come back again with my family. We are already making plans! I arrived at the church at around 3:40PM excited to participate in my first Ukrainian Catholic Divine Liturgy. I found a place in a rear pew and began to pray and to prepare myself mentally for my presentation. I saw a priest coming down the aisle toward me who I surmised must br Fr. Vasil. He waved me out to the vestibule and greeted me warmly. I thanked him for inviting me to speak to his parishioners about St. Therese. After exchanging pleasantries, I tried to ascertain the logistics of my talk as I understood them – a 45 minute talk on “St. Therese and the Year of Faith” to be given at the conclusion of the Divine Liturgy. Fr. Vasil shot me a quizzical look and said, “Oh, no! You will speak in the middle of the Divine Liturgy after the readings. No more than 10 minutes.” I was flabbergasted. Just a little communication glitch! I now had justs moments to pare my presentation down from 45 to 10 minutes. Needless to say I was a bit frazzled! I went back to my pew and scrambled feverishly to concoct something valuable and coherent to say in a 10 minute talk. I found what I thought was a winning formula just as the mass started – a funny story, followed by a brief explanation of the Year of Faith, followed by an overview of St. Therese and why she was so important for Catholics to learn about. Whew! The beauty and novelty of the Ukrainian Catholic Liturgy almost made me forget about my situation. For anyone used to the Latin Rite mass, the Eastern Catholic masses can seem a bit strange at first. There are many more responses given by the people than in a Latin Rite mass. The sign of the cross is performed using three fingers and crossing from right to left instead of vice versa. This is done countless times during the Liturgy. The first reading was read by a young man who remained in his pew instead of reading from the lectern. Lastly, and most strikingly, the priest consecrated the Eucharist facing away from the congregation like in the Tridentine Mass. After Fr. Vasil read the Gospel, he gave me a brief introduction and then called me to the front to speak about St. Therese. Before beginning I surveyed the faces in the crowd and was pleased to see many attentive expressions that seemed to say, “Who is this very un-Ukrainian-looking man and what is he going to say to us?” I didn’t leave them in suspense. I gave my teaching about St. Therese for what I estimated was about 10 minutes. I looked down at Fr. Vasil sitting in the front row and said, “I guess my time is about up so I will conclude.” He responded, “You can keep going.” I went from paring down to filling out my comments very quickly! I concluded by inviting all to venerate the First Class Relic of St. Therese after the Divine Liturgy. Fr. Vasil annointed our foreheads with Holy Oil for Pentecost. Many people came up and reverently venerated the relic and some intoduced themselves and welcomed me to the parish. One woman stayed to speak with me after mass and gave me a veritable teaching on Ukrainian Catholic traditions and identified and explained every icon in the church. She and Fr. Vasil thanked me for coming, bade me farewell, and invited me to come back to worship with them some other time. I will certainly do just that. Beatification is the penultimate step before canonization for a deceased person of heroic virtue. Someone who is beatified by the Church receives the title of Blessed and is recognized as having entered into heaven and has the capacity to intercede for those who pray to him/her. Two of the last four deceased popes currently carry the title of Blessed – Pope John XXIII and Pope John Paul II. Of course it is possible that Blessed Pope John Paul II could be canonized a saint by the end of this year! After Therese of Lisieux died in 1897, a ‘storm of glory’ broke out where hundreds of testimonies and miracles were reported. The Vatican was forced to speed up the canonization process for Therese because the clamor of the people on her behalf was so loud. During World War I so many French and German soldiers prayed to Therese from the trenches that 5 volumes would have been required to tell all the stories! Therese was formally canonized by the same Holy Father only two years later on May 17, 1925 and has been known to the world ever since as St. Therese of the Child Jesus, St. Therese of Lisieux, or the Little Flower. Today is also the Feast Day of St. Catherine of Siena, a 14th Century saint and mystic. She is one of only four women to be declared a Doctor of the Church along with St. Teresa of Avila, St. Hildegard of Bingen, and, of course, our little Therese. A few weeks ago I gave two presentations on St. Therese at two different parishes on the same day. Here’s how it transpired. I was scheduled to give a presentation entitled, “St. 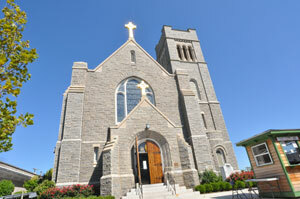 Therese and the Year of Faith”, at St. Matthias Parish in Bala Cynwyd, PA at 1:30PM. It is always a bit ‘touch and go’ trying to find the designated venue in a new location. Maria and I made a detour into the Elementary School upstairs before being redirected by a lady to the Parish Hall on the first floor. As we entered the hall, the woman running the event, a very nice lady named Dolores, greeted us enthusiastically and showed us around. She had gone all-out for the event covering each table with a white tablecloth bedecked with rose petals . A nice touch for a teaching on St. Therese. She had coffee and all kinds of desserts available for the attendees. Dolores was the leader of the Highlanders – the seniors group at the parish so called because Highland Ave. runs along one side of the church and the area was predominantly Welsh when it was settled. She said that they usually had around 10 people at the meetings, but due to her masterly job of advertising, no less than 45 people attended the talk. Every seat was taken. I was a bit nervous before the talk because I was getting over a cold and my voice was not yet 100%. I also tend to sweat when I have a cold. Not a great combination being hoarse and sweaty for a presentation! I did the best I could and it went extremely well with the very attentive audience who laughed at all the right places. The talk concluded with a 15 minute question and answer time. The most inspiring part for me, however, was how reverently many of them venerated the first class relic of St. Therese after the presentation. Several people were suffering with serious conditions and asked that the relic be touched to their ailment. Many touched rosaries or devotional items to the relic with much faith. One woman shared that it was her 75th Birthday (she didn’t look a day over 60) and she had made the day special by treating herself to my talk! The people who worked in the Parish Office next door requested that I come over so they could venerate the relic. A few ladies kissed the relic and asked questions about it. One of the priests made a special trip downstairs and asked that I bless him with the relic. It isn’t every day that a layman gets to bless a priest! The visit concluded after they showed me a skullcap that Blessed Pope John Paul II had given to the Monsignor. There is an old saying that goes “expect the unexpected”. That perfectly sums up the talk later that evening at one of our favorite local parishes, Our Lady of the Assumption in Strafford, PA. Things did not go exactly according to plan. I thought that the presentation was to take place in the Sacred Heart Chapel under the church at 7PM. Unbeknownst to me, it had been advertised for 7:30PM in another building called the Upper Room. The man who was supposed to let me in the building was unable to come because he was sick. Luckily someone who knew the combination to the lock saw my distress and let me in the building. She gave me the caveat that I must keep the door propped open or it would lock behind me. She wished me well and departed. As I was making my second trip out to the car while setting up, I forgot her warning and my stomach dropped as I heard the door shut behind me with a thud. I had locked myself out of the building and people would be arriving soon. I thought that it would be quite embarrassing to be stranded in the parking lot with the attendees of the talk due to my own negligence! I prayed for assistance and thankfully it came almost immedately in the form of a very nice nun named Sr. Kathleen. She not only knew the lock combination, but knew the trick for propping the door open in a foolproof way. She helped me set up and even attended the entire presentation, something she had not planned to do. I am grateful to the many people who attended, especially one man named Richard who even came back again the next evening and brought his sister-in-law who was visiting from Memphis. At one point I was telling a story when a commotion broke out in the room. I saw Monsignor Marino standing in the doorway while his dog, Denis, ran around greeting everyone like a good host. It was my first canine cameo at a talk! We are now roughly halfway through the Year of Faith. How is everyone doing with it? What specific things have you chosen to do to grow in your faith this year? Maria has been very consistent with her resolution to pray the rosary every day. I am still plugging away through the Catechism. Let me know how you are doing. There had never been a photo like it before. 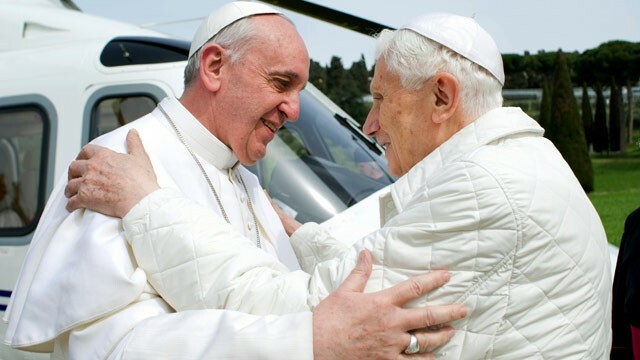 Two men wearing the white papal cassocks embracing. Almost by definition the previous Pope is dead and buried before his successor assumes the papal office. On March 23rd this image changed when Pope Francis visited Pope Emeritus Benedict XVI at Castel Gandolfo. The helicopter had barely settled on the tarmac before Pope Francis enthusiastically greeted his predecessor like an old friend. It was a beautiful and touching moment immortalized on film. After the initial meeting, they immediately went to the chapel to pray together. There a special chair and prie-dieu for the Pope was set up at the front of the chapel. In a classic moment Pope Francis bypassed this place that was rightfully his as the Holy Father in order to join the Pope Emeritus in a regular pew. The feeble Pope Emeritus tried to grab Francis’ arm and corral him into the special chair, but the Pope would not have it. 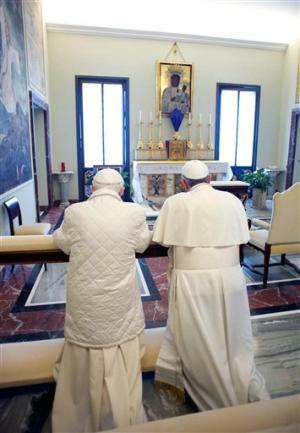 He whispered to Benedict XVI, “we are brothers”, and knelt next to him in the lower place. Astounding! Here were two men who both enjoyed immense power in the Church as the leader of 1.2 billion souls and they were trying to outdo each other in humility. This was truly a unique and inspiring sight. It was a great example of what Jesus tried to teach his apostles after they had been arguing about who was the greatest. “Then he sat down, called the Twelve, and said to them, ‘If anyone wishes to be first, he shall be the last of all and the servant of all’.” (Mark 9: 35) Pope St. Gregory the Great highlighted this very lesson when he coined the papal title of the “servant of the servants of God”. 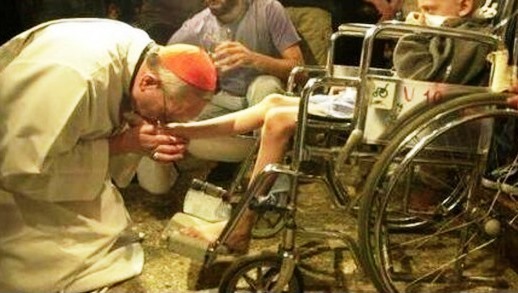 He knew that the Holy Father must lead with the example of humility and service. I don’t know when Pope Francis and Pope Emeritus Benedict XVI will meet again, but I’m sure that when they do they will still be trying to outdo each other in humility and service. The most famous bird on the planet was perched on the copper chimney atop the Sistine Chapel. For over 40 minutes he remained at his post completely oblivious to the fact that thousands of camera lenses and millions of onlookers were observing his every move. 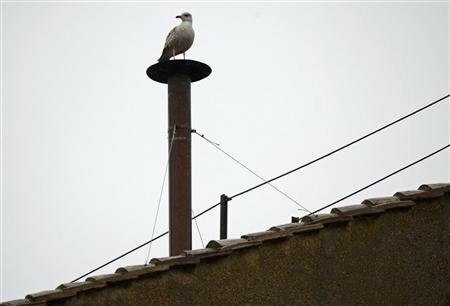 I joked with Maria that because the bird was a seagull the new Roman Pontiff would hail from a coastal city. Maybe it portended the election of Cardinal O’Malley of Boston or Cardinal Dolan from NYC. Could it be? The new Pope would indeed come from a coastal city in the Americas – from the Argentinian Capital of Buenos Aires. The feathered sentinel didn’t stick around to witness the outcome. At first the smoke appeared to be jet black, but it quickly metamorphosed into an unmistakable cascade of white. The bells of St. Peter’s Basilica tolled in confirmation. Habemus Papam! We had a Pope. A little after 8:00PM Rome Time on March 13th the world caught its first glimpse of the new Holy Father. He strode onto the central loggia with a peaceful bearing; the picture of serenity in the eye of an admiring storm. Thousands of flashbulbs flickered like so many fireflies on a summer night. It’s always exciting to see a new Pope, but also a bit jarring to view a new man donning the familiar white robes. He greeted the crowd with a casual “good evening” and said that the cardinals had to go to the end of the world to find the new Pope. This was certainly true. The new Successor of St. Peter asked those gathered in St. Peter’s Square to pray for him in silence before he imparted his first Apostolic Blessing. 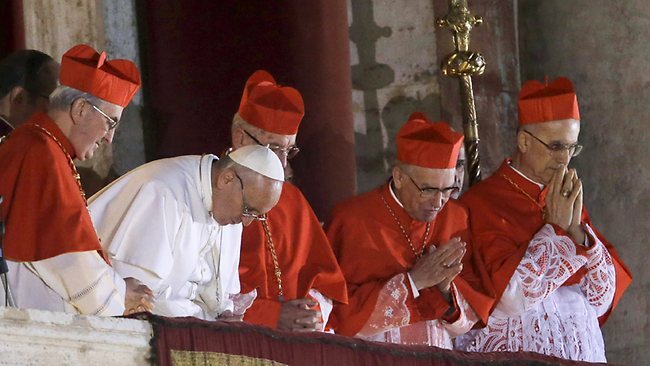 He bowed forward and one could hear a pin drop as over 150,000 people prayed silently. One TV network thought that they had lost their feed it was so quiet! The world could already see in a dramatic way that this new “Papa” was going to be his own man and do things differently than his predecessor – the beloved Pope Emeritus Benedict XVI. Who was this man that two-thirds or more of the cardinals had voted for on only the second day of the conclave and the fifth ballot? His name is Jorge Mario Bergoglio, the Cardinal Archbishop of Buenos Aires, Argentina until his election to the papacy. This man set many firsts in one fell swoop. He is the first Pope to take the name Francis (after the 13th century Poverello who became one of the most beloved saints in the world), the first Pope from the Americas and the Southern Hemisphere, the first from the Jesuit Order founded by St. Ignatius Loyola, and the first non-European Pope since the Syrian Pope St. Gregory III in 741 – over 1,200 years ago! 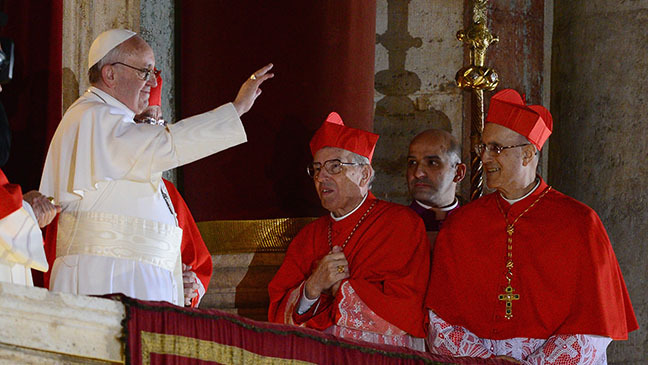 Even though he had garnered the second most votes after Benedict XVI in the 2005 Conclave, he was a definite dark horse this year because he is 76 years old. Pope Francis has demonstarted in only a few days that he has his own style. He is typically “Latin” and gestures with his hands while speaking and expressing emotions with his eyes. He is very tactile and personable when interacting with others and has a real heart for the poor and downtrodden. While Archbishop he frequently reached out to those in the slums of Buenos Aires and even washed the feet of a man with AIDS. He led a simple and austere life back home trading in the Archbishop’s Palace for a small apartment and his limousine for public transportation. He desires that the Church should witness clearly to its preferential option for the poor and should live with the poor. In other words, he walks the walk in addition to talking the talk. One thing is for sure, the Church will be in for a great adventure under the leadership of Pope Francis (it is incorrect to call him Pope Francis I until if and when there is a future Pope Francis II, just as nobody referred to World War I until there was a World War II). His actions in the first few days of his papacy are definitely a harbinger of interesting things to come. I for one can’t wait to take the ride! Happy St. Patrick’s Day tomorrow to everyone! 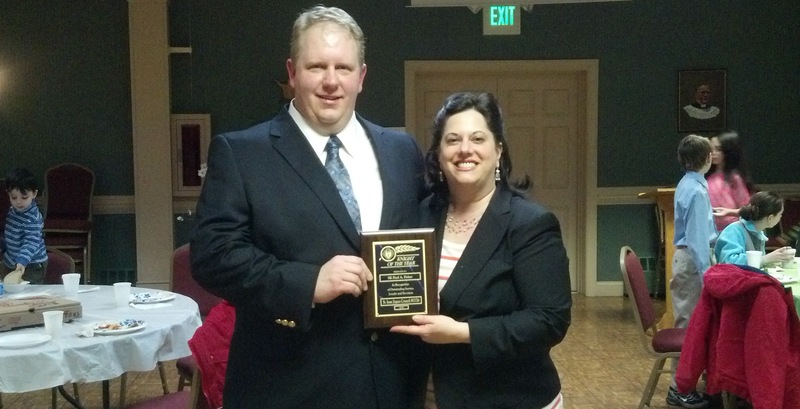 I am very grateful to the Knights in my Knights of Columbus Council for giving me the great honor of ‘Knight of the Year’ last weekend. One thing was for certain – we would be traveling in style. Five men piled into the Lincoln at 7:30AM to make the 40 minute drive to the Annual Archdiocese of Philadelphia Men’s Spirituality Conference last Saturday. My brother-in-law, Dan, works for Ford Motor Company and his company car would act as our taxi. Men of all ages converged on Archbishop Ryan High School in Northeast Philadelphia for the conference. Over 1,100 men would be in attendance, which was a record for the five years of the event. I had the privilege of greeting Bishop John McIntyre, an auxiliary bishop of Philadelphia, shortly before he led the men in morning prayer. The first speaker of the day was very inspirational. Jim Towey, the President of Ave Maria University, was the personal attorney for Blessed Mother Teresa of Calcutta for 12 years. He asked the crowd why Mother Teresa needed an attorney. “Because she liked to sue people!” he said facetiously. Mr. Towey related how he first met Mother Teresa in 1985 shortly after one of his best friends committed suicide. He went to visit her at her Home For the Dying in Calcutta and was greeted by one of the nuns who told him to go clean the wounds of the patient in Bed 46. All his sensibilities revolted at the idea, but something impelled him to carry out the directive. That day something in him changed for the better and he realized that love and service for others was the key to living a happy and holy life. What is the Bed 46 in your life that you fear and have to overcome to realize God’s plan for your life? 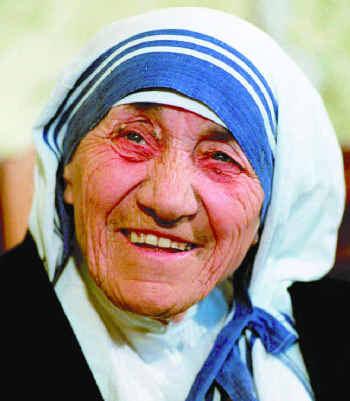 We all know the public Mother Teresa (who took her name from St. Therese of Lisieux) who founded the Missionaries of Charity and won the Nobel Prize in 1979 for her tireless work with the destitute and dying in the squalor of Calcutta, India. Only a few knew the private Mother Teresa, and Jim Towey was one of those privileged few. He told many touching stories of their time together such as the time that she tracked him down to make sure that he had something to eat. She came to him through the throngs of people and put a banana and a peanut butter sandwich in his hands. On another occasion shortly before her death when she was infirmed, she literally jumped out of bed with childlike excitement when Jim said his children were coming to visit. He told of his last meeting with her and about her beautiful death. The others speakers at the conference did not disappoint. Richard Lane, the son of NFL player “Night Train” Lane and a very prolific Catholic speaker, gave a very dynamic presentation about five qualities that a Christian man needs in order to thrive. Don “Big Bird” Saleski, was a hockey player in the NHL from 1970-1980 and was on the Philadelphia Flyer teams in 1974 and 1975 that won the Stanley Cup. He spoke about his faith journey and about key areas that Christian men need to develop. Christopher West, best-selling author and teacher, rounded things out with a rousing presentation on Blessed Pope John Paul II’s Theology of the Body. 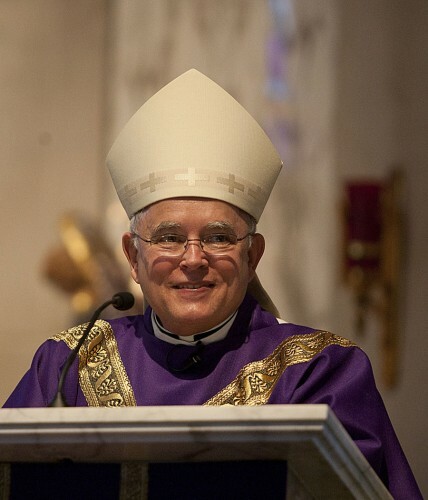 The day concluded appropriately with the Celebration of Holy Mass with Archbishop Charles Chaput for the Third Sunday of Lent. When the time came for his homily, he asked if it would be alright if he descended from the stage to speak because the lights were in his eyes and he wanted to see his audience. Once down on our level, the diminutive prelate asked jokingly if the men could see him! We yelled out that we could. He proceeded to give an excellent homily and spoke at length about each of the three readings from Exodus, 1 Corinthians, and Luke respectively. He exhorted the men to be deeply rooted in Jesus Christ and the Catholic Church and to be witnesses and missionaries in the world. By the conclusion of the mass at 5:30PM we were all quite tired and hungry and it was time to pile back into the Lincoln and set off for home. We shared about some of our personal highlights from the day on the drive home and arrived back in Wayne just as the sun was sinking low in the sky. When you begin to be known as “the Therese guy” people seem to come out of the woodwork to give you Theresian gifts. This has been happening to me quite a bit lately. It usually happens at odd times. One day recently I was praying at the Eucharistic Chapel and I felt a gentle tap on my shoulder. A woman that I knew whispered in my ear that she had some literature and a magazine article about St. Therese that she wanted me to have and that she would leave it for me in an envelope at the chapel entrance. I thanked her. Sure enough, a few days later an envelope with my name on it was waiting for me. Another woman told me that she had a ceramic picture of St. Therese that she wanted to give me. She didn’t have enough room to hang it in her home. Maria and I had run into her at a subway station in Washington, D.C. several years ago when we had participated in the Annual March For Life. It’s a small world. She had also attended one of my talks on St. Therese at St. Isaac Jogues Parish. I knew the drill now. She likewise left a package with the ceramic picture for me at the chapel entrance. One of the men in my Knights of Columbus Council had enjoyed one of my talks and presented me with a framed picture of St. Therese at one of our meetings. The picture was of Therese washing dishes and he said that it was his wife’s picture and she wanted me to have it. I was very touched by the gift and by the presentation at the meeting. I recently ran across a book entitled, “Journey With Therese of Lisieux, Celebrating the Artist in Us All”, by Br. Michael O’Neill McGrath, O.S.F.S. and, to my great surprise, this same picture of Therese washing dishes was there on page 23! I learned that the picture was titled “Doing the Dishes and God’s Work” and that it celebrated discovering God and His love in all the small moments and tasks of life. After all, most of our lives are comprised of such small moments and tasks so we might as well offer them for the love of God. Just today before mass I ran into a friendly Filipino woman who had attended my two talks at St. Katharine of Siena Parish last July. I informed her that the relics of St. Therese were now in Cebu in the Philippines. She thanked me profusely for telling her and said that she would be giving her relatives in the Philippines a call! She slipped a red pouch with a zipper into my hand and told me that it contained a St. Therese rosary. I am very grateful for all these thoughtful gifts and it is very encouraging to witness how much people love and appreciate St. Therese and her influence in their lives. I am also grateful that I can be a part of Therese’s posthumous mission in the world in some small way. We seek to commemorate the important events and milestones in our lives. St. Therese would often compose poems or plays to honor one of the Carmelite nuns on the anniversary of her taking of the veil or Solemn Profession. 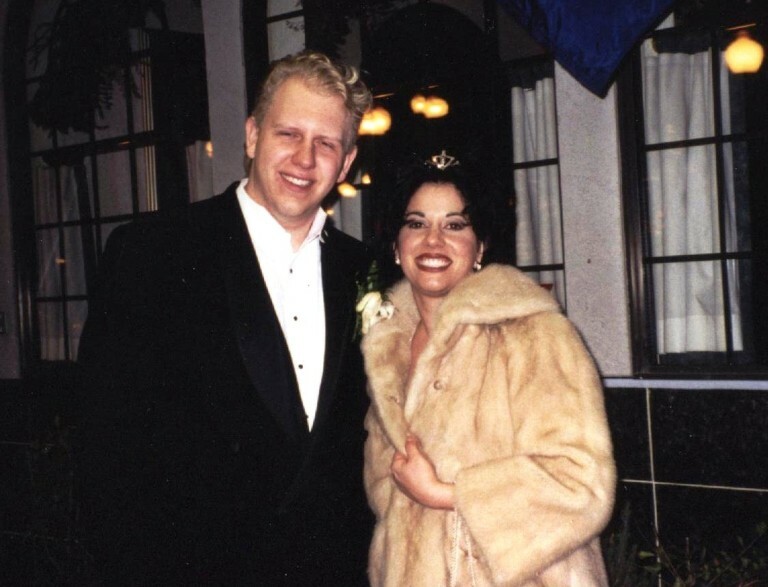 Well, Maria and I were married on St. Valentine’s Day, February 14, 1998, in Steubenville, OH and yesterday was our 15th Wedding Anniversary. The idea came effortlessly. We would take the day off and drive down to Cape May, New Jersey, which is a quaint, beach town at the end of the peninsula at the southernmost point in the state. We departed in the morning and made the two hour drive south over the Commodore Barry Bridge into NJ and past fields bedecked with the light snowfall from the night before. I had a cup of coffee in my hand and the woman I loved next to me. Could it get any better than that? The drive seemed to fly by like the fifteen happy years of our marriage and we reminisced about fun memories of our journey together. The sun shone brightly as we arrived at the Cape May Lighthouse and walked out onto the deserted beach. It was an unseasonably warm day for mid-February and we were able to walk and talk together on the beach for quite some time as we watched sea birds plunge into the waves for fish and the sunlight dancing on the water. Maria and I left the beach with seashells and three Om rocks. Let me explain. We gathered the conchs and other shells ourselves. The Om rocks were given to us by a man with a bicycle who had painted the rocks himself and insisted that we take the rocks as a gift. He explained that the rocks owned us and that we did not own them and that they would be around long after we were gone. He was a nice, but perhaps misguided man who seemed to want to both “pay it forward” by giving gifts and to evangelize us to his worldview. 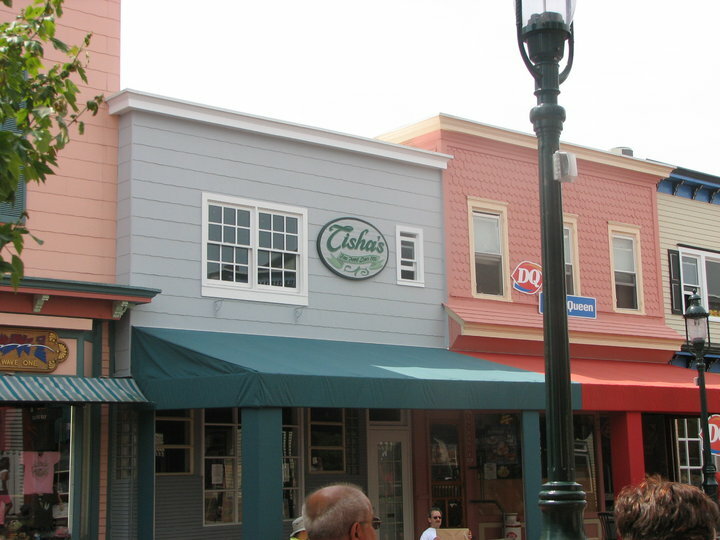 Following our beach excursion, we drove to downtown Cape May. Our first stop had to be Our Lady Star of the Sea, the Catholic Church in the heart of the town. We prayed in the church for a short time giving God thanks for the beautiful day. I also prayed by a statue of St. Therese near one of the side doors of the church. I asked Little Therese to bless my ministry and to help me teach people her message of love and humility. felix coeli porta Happy gate of Heaven. Holy Mother Mary is truly the star that will lead us to God just as the Star of Bethlehem led the Wise Men to Jesus 2,000 years ago. Upon our departure from the church a cafe called Tisha’s beckoned to us and we enjoyed a delicious lunch of crabcakes and salad. We strolled the town square for a while and had the place mainly to ourselves on this weekday in the off-season. 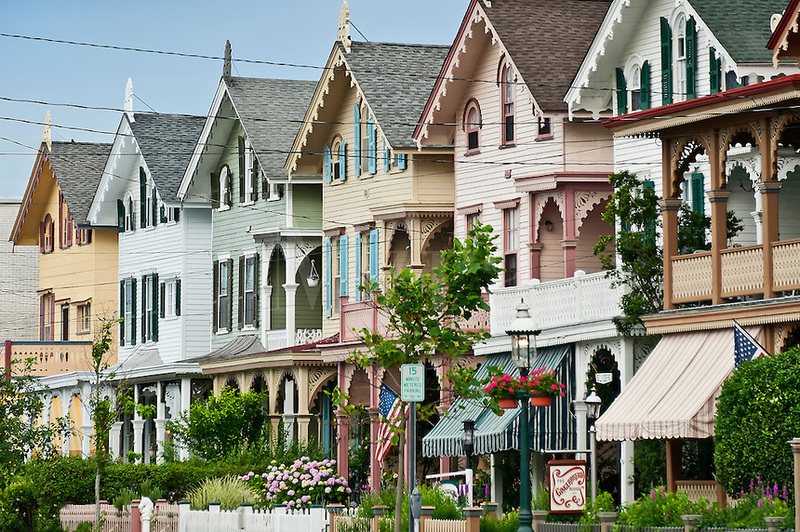 Cape May became a resort town during the late Nineteenth Century so the streets feature countless Victorian houses, many of which have been turned into Bed and Breakfasts. 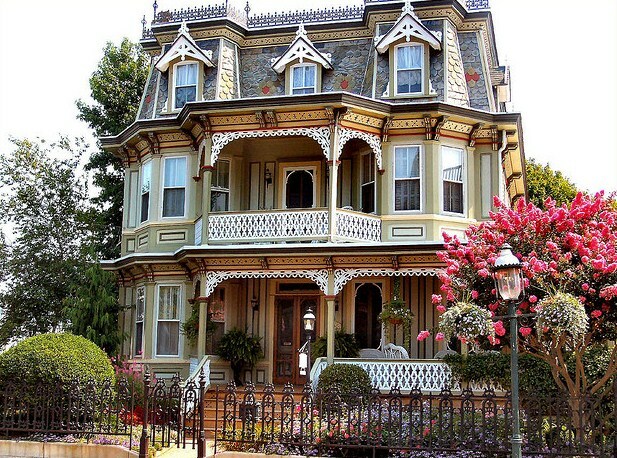 I love Victorian architecture and enjoyed seeing the myriad of different designs. Many of the houses featured historic plaques stating the years that they were constructed. St. Therese lived her entire life during the Victorian Era and I tried to remember a key event from Therese’s life that corresponded to each year. For instance, 1884 reminded me of the year she made her First Communion and 1894 represented the year that Therese discovered her Little Way. Maria suggested that we travel up to Brigantine Island where her family spent Summers when she was growing up. We hopped onto the Garden State Parkway and made the half hour drive up the coast. Along the way we kept seeing flashing public notification messages telling drivers to be on the alert for a black car of a certain make and model. We were driving a black car of the exact same make and model! We didn’t panic, though. The police wanted a car with NJ license plates and we had PA plates. It seemed we were in the clear. The only way to get onto Brigantine Island (except by boat) is to drive past the glitzy billboards and casinos of Atlantic City and to take a bridge across the Absecon Inlet. We drove by the condominium where Maria and her family vacationed when she was young and then took one more look at the majestic Atlantic Ocean. The sun was dipping low in the sky so we drove over to the north side of the island so we could see the sunset over the bay. The bright orange-yellow sun was hanging just above the horizon as we found a perfect spot by a pier. The colors changed to a deep red-orange as the orb finally descended out of sight. It was our cue to call it a day and depart for home. I am so grateful to God for giving me a wife like Maria. She is such a fun and easy person to go through life with and she never ceases to encourage me in all that I do, especially my ministry of spreading the message of the Little Way of St. Therese. She has a great sense of humor and is the exact same person at home as she is in public – warm, friendly, and loving. She has a beautiful smile that I never get tired of seeing. She is my best friend and the love of my life. Maria, Happy 15th Anniversary. I love you.